This ASCD Study Guide is designed to enhance your understanding and application of the information contained in A World-Class Education: Learning from International Models of Excellence and Innovation, an ASCD book written by Vivien Stewart and published in February 2012. You can use the study guide after you have read the book or as you finish each chapter. The questions provided are not meant to cover all aspects of the book but, rather, to address specific ideas that might warrant further reflection. Most of the questions contained in this study guide are ones you can think about on your own, but you might consider pairing with a colleague or forming a study group with others who have read (or are reading) A World-Class Education. How does the academic performance of U.S. students compare with that of students in other countries? Why does it matter? Think about the various economic, technological, environmental, and political changes that are transforming the world today. What implications do they have for the future of education? International assessments provide country-by-country rankings, but what else can educators and policymakers learn from the results of these assessments? Consider what has enabled some education systems to rapidly improve educational performance while other systems' performance remains static. How are countries using international assessments as a tool for improvement? Consider the ways in which Singapore used education to leap from the third world to the first. Which of these measures might be adapted and used by districts or states in the United States? Think about how Ontario, Canada, created collaborations between government and unions to sustain reforms over time. Now consider current reform measures in your own district. Would they survive a turnover in leadership? What do you see as the keys to maintaining a commitment to continuous improvement? How did Finland make teaching such an attractive profession? How does the status of a teacher in Finland differ from the status of a teacher in the United States? China has a long-range plan with ambitious goals for preparing Chinese students for a global knowledge economy. What would you include on a list of U.S. education goals for 2012? Consider the various challenges faced by the high-performing and rapidly improving education systems profiled in this chapter. How might these challenges be overcome? What are the key strategies that high-performing and rapidly improving countries have used to achieve excellence? Which are familiar to you? Which are surprising? What are the key strategies that high-performing and rapidly improving countries have used to achieve equity? Which are familiar to you? Which are surprising? Many of the practices of high-performing systems are also implemented in some U.S. districts and states but not systematically or at scale. What are some of the obstacles to expanding best practices beyond pockets of excellence? What capacities do districts or states need to build in order to make this goal a reality? What are the strengths of American K–12 education that other countries admire? Do you think it's possible for the United States to remedy its education weaknesses without sacrificing those strengths? Where does the work begin? What policies and practices have high-performing systems implemented to attract and recruit talented people into teaching? What could your district/state do differently to actively recruit more high-quality and committed graduates, especially in shortage areas? What might education leaders and policymakers do to raise the status and attractiveness of the teaching profession in your region? In your district, what is the attrition rate of teachers in the first three years of service? What changes to new-teacher mentoring and support programs might help reduce that attrition rate? What is your district's approach to professional development and professional collaboration? What measures are in place—or might be enacted—to ensure systematic, cost-effective professional development that is coordinated with the district's key academic goals? What does international best practice suggest about the design of fair and effective teacher evaluation systems? Does your district have a career ladder that enables the best teachers to take leadership roles in school improvement and teacher development? How might the system you have be adapted bring it more in line with best practices? Review the models of leadership training discussed in the chapter. Do principals in your district/state feel prepared to lead schools towards excellence, equity, and innovation in a 21st century environment? What kinds of training would better prepare administrators for the challenges they face? Look at the Common Core State Standards in reading and math, which are intended to set internationally benchmarked high expectations for all students. What actions would your district/state need to take to get all students to meet those standards? Where does the work begin? What knowledge and skills are most important in the 21st century? This chapter suggests four major characteristics of global knowledge and innovation societies that have implications for curriculum and instruction. What changes must be made to your school curriculum to prepare students for the world of 2020 and beyond? How do U.S. practices in assessment differ from those of high-performing countries? What changes in your district's current approach to assessment would support the development of higher-order skills and lead to higher student achievement? How might your district/state build public support for a world-class public education system that embraces excellence, equity, and a global and future orientation? What data and models would you share? How would you build your case? What are some of the most powerful uses of digital technology? Given the capacity of today's technology, how might we reconfigure schools to better prepare students for success in the 21st century? What are the most important steps we can take to prepare students for work and citizenship in a global future? How could your schools, teachers, and students become more engaged globally? 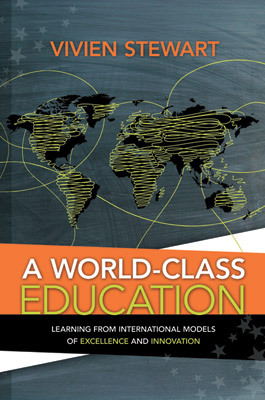 A World-Class Education: Learning from International Models of Excellence and Innovation was written by Vivien Stewart. This 192-page, 6" x 9" book (Stock #111016; ISBN-13: 978-1-4166-1374-9) is available from ASCD for $19.95 (ASCD member) or $26.95 (nonmember). Copyright © 2012 by ASCD. To order a copy, call ASCD at 1-800-933-2723 (in Virginia 1-703-578-9600) and press 2 for the Service Center. Or buy the book from ASCD's Online Store. Copyright © 2012 by ASCD. All rights reserved. No part of this publication—including the drawings, graphs, illustrations, or chapters, except for brief quotations in critical reviews or articles—may be reproduced or transmitted in any form or by any means, electronic or mechanical, including photocopy, recording, or any information storage and retrieval system, without permission from ASCD.